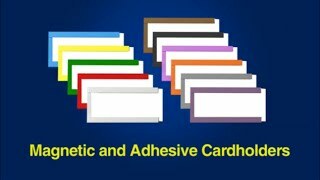 and Perforated Card Inserts 18 colors in letter size sheets for PC printers. Stick-Anywhere™ Foam Adhesive. FEEDBACK: "These holders were exactly what we had been looking for to use on our mailboxes. All we could ever find were the magnetic versions and we didn't want anything that we had to worry about falling off. These were the perfect solution."